The Liget Project Competition, as established in its general strategy, aims to turn the City Park into one of the most important museum areas of the world: nature and architecture will coexist in a unique and vibrant environment, in which visitors can enjoy both the naturalistic beauty of the park, and the exiting activities planned by the different new institutions: the National Gallery and Ludwig Museum, the Museum of Ethnography, the Museum of Architecture and Foto-Museum, and the House of Hungarian Music. Even though in Budapest several classical concert halls are already present, the House of Hungarian Music wants to be an innovative cultural platform for music: in fact, its main challenge is not only to provide a modern and performing event hall for several events, but manly to open the heritage constituted by Hungarian Music to domestic and foreigner visitors. 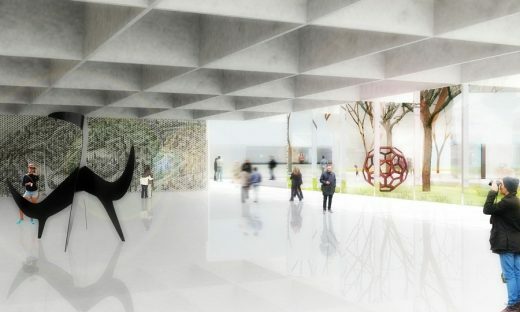 For that reason, the new building will work as a Cultural Centre, based on exhibition spaces, educational multimedia spaces, library, and other small activities capable to attract people (café, shops, lecture halls, etc.). So the real character of the House of Music is hybrid: basically it’s a didactic educational institution, centred on an intense cultural activity, but at the same time is a public collective space where people can gather and share different events. 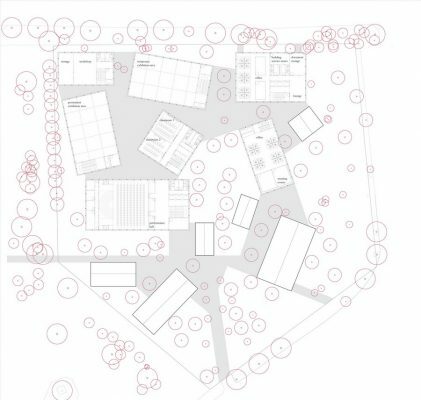 Once accepted the general conditions of the programme, “An Urban Archipelago” attempts to re-¬‐create on the site of the City Park the same complexity and heterogeneity typical of the contemporary cities. In order to achieve that, it’s necessary to work with fragments and diversity: if in the XIX ‐ XXth century, Budapest urban grid was made of Cartesian axes and regular blocks, today An Urban Archipelago manipulates such regularity, by introducing difference and repetition. 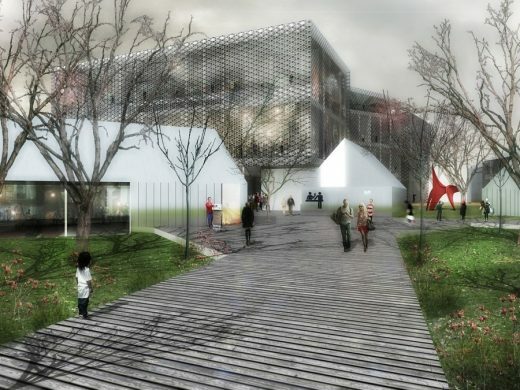 The House of Hungarian Music will be constituted by small different objects, connected each other by common routes and a general landscape configuration. Every object will have its own specific function and identity. 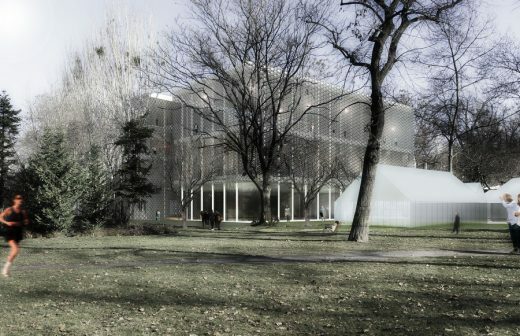 If compared with the huge extension of the City Park, the new House of Hungarian Music, conceived as the sequence of objects, will work as an urban archipelago: isolated and autonomous in its own configuration, but at the same time interconnected in each of its components. Just by using the fragment as guiding light of the entire design process, An Urban Archipelago will achieve two fundamental challenges: on the one hand, the functional and formal heterogeneity of the city is thus reproduced in the middle of the City Park, with many different and interconnected buildings, settled into a naturalistic promenade. On the other hand, a kind of alliance between nature and architecture is created. All of the existing plant and tree species, present on the project site, are preserved. Like a puzzle, the House of Hungarian Music is built all around the trees, and no tree is cut down. 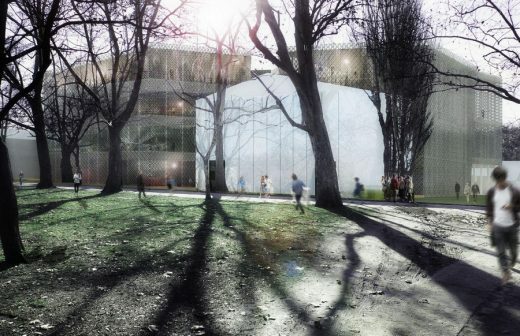 By respecting the current green configuration, the House of Music appears as hidden in the middle of a forest. From outside, only few buildings are perceivable. 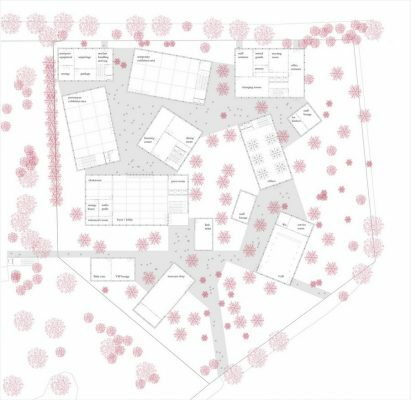 Inside, the landscape strategy invite visitors to venture into this “forest”, and enjoy the sequence of architectural and naturalistic spaces. A sort of architectural camouflage is achieved: only the most important functions are visible from the distance: and at night, music and light will guide the visitor to the right building! 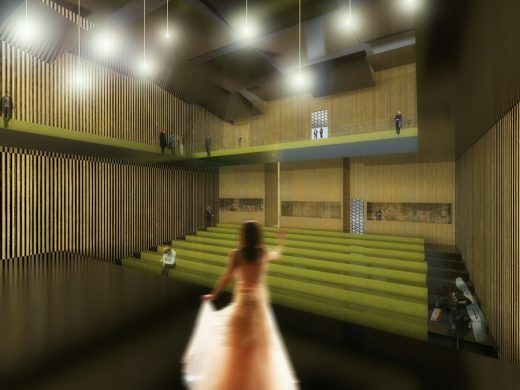 The House of Hungarian Music will consist of different objects, with different specific functions: the Event Hall, Permanent and Temporary Exhibitions, Learning Centre, Office-Staff area, Artefact Handling, Café, Museum Shop, Info Ticket. Every fragment is different from the other, formally and functionally. House of Music’s representative functions are of course the Event Hall, the Exhibition areas and the Learning Centre: for this reason they are higher than the rest of the functions (15 mt), and have a different material configuration, in order to outline their importance and their immediate recognisability. 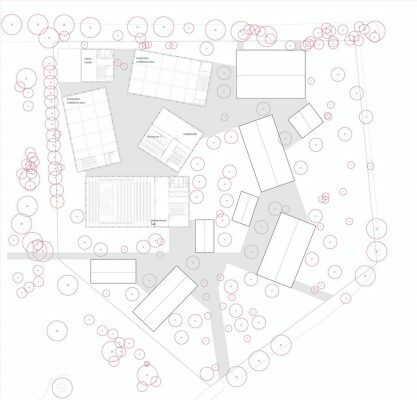 These functions also constituted the conceptual core of “An Urban Archipelago”: like a Russian Matryoshka, all around them smaller objects are installed (the staff area, café, museum shop, lounge, baby care, info-¬‐ticket, etc); and all of the in-between spaces among them are occupied by the existing trees and green surfaces. 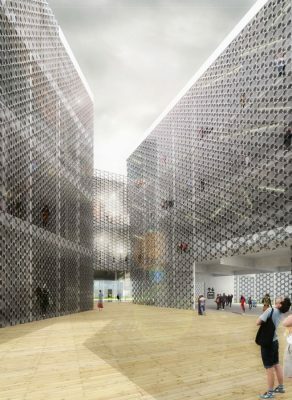 So, “An Urban Archipelago” can be read as the superposition of three different sub-¬‐groups: the central core of the project, constituted by the Concert hall, the exhibition spaces and the Learning Centre, cladded with a perforated metal grid, capable to show what happens inside the building; a second sub-group formed by small “islands”, complementary functions for the development of the general programme; and lastly, the Green area, constituted by the existing trees that completely wrap the House of Music. Despite of the peculiar topographic configuration of the site, “An Urban Archipelago” is designed to guarantee the highest level of accessibility: actually the access to the buildings is allowed for cars, pedestrian, bikers, and mainly public transportation. 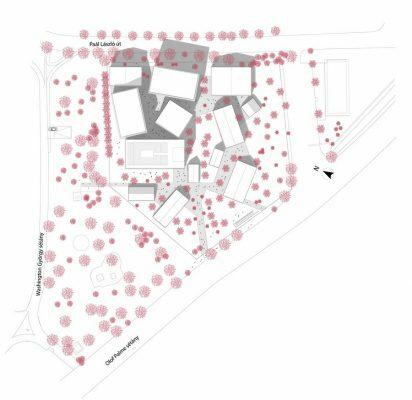 Of course the use of public transportation is strongly encouraged: so visitors can reach the site by bus and access the complex from south. There they will find the info-ticket building, before entering the different functions. Bikers can leave their bike at the entrance and follow the same route. At the same time, employers and staff can also enter the buildings from north, where they can find their offices, their changing rooms, lounge area, etc. In order to facilitate storing, packaging, and handling, the artefact handling functions are located on the northern border of the site, with two specific accesses. As stated by the programme, a small underground parking area for 20 cars is located on the west side: cars’ route is totally distinct from pedestrians’ route, so there is no interference or superposition. “An Urban Archipelago” is based on a rigorous bioclimatic approach: every design decision is made to optimize energy performances and economical costs. For example, thanks to the use of u-glass and polycarbonate panels (in the interiors), it’s possible to manage and control a great amount of energy, to reduce maintenance costs and save money for heating and hydraulic systems. The right use of these materials will create a well-¬‐tempered environment able to achieve the optimization of the energetic functioning of the building. At the same time, the respect and preservation of the existing vegetation will permit to protect the buildings from wind, atmospheric agents, and control the general level of comfort. In order to be more precise, we may say that “An Urban Archipelago” ‘s sustainable strategy is based on four different categories: ecology, energy reduction, waster reductions, and health. Each category can be analysed according to different themes: biodiversity, greening, water conservation; daily energy efficiency; C02 reductions, waste reduction; and lastly, interior environment, water resource, wastewater treatment. 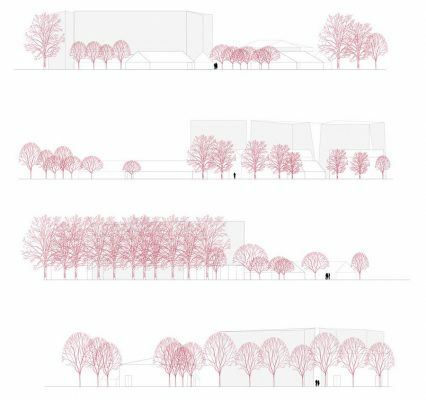 By applying for these categories, the proposal for the House of Hungarian Music attempts to build a real “green” architecture.